After Record-Breaking Rim Fire, Log Trees or Leave Them? Last year’s record-breaking Rim Fire left thousands of acres of dead trees around Yosemite National Park. What to do about those trees has sparked a fierce debate. Later this week, the U.S. Forest Service will release plans to allow logging companies to harvest some of the dead trees. Some environmental groups say it would destroy important wildlife habitat. On several thousand acres, the decision has already been made. Sierra Pacific Industries, the second largest lumber company in the country, had crews harvesting trees on the company’s private land within weeks of the Rim Fire. “You can see here from some of these logs, if you look beyond the bark, inside the wood looks pretty good,” says Mark Luster of Sierra Pacific Industries, pointing to stacks of hundreds of burned logs at the company’s saw mill in Sonora, California. About 90 percent of the wood is still usable and will become everything from two-by-fours to number two pencils. 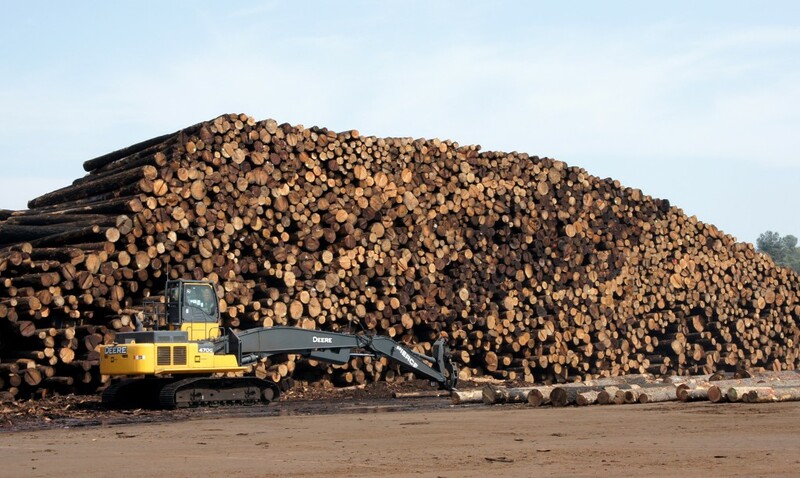 Sierra Pacific Industries is hoping to move onto logging Forest Service land next. Opening it up would provide an economic boost to the region, Luster says. “It makes sense to create jobs here in California, get our wood here and create jobs for Californians,” he says. California’s timber industry has shrunk dramatically over the decades, while the market for wood has not. The Forest Service has other motivations for the plan. “If all the standing dead is left, it’s that intensity of that next fire that comes through,” says Maria Benech, who is working on the Forest Service’s plans for salvage logging, as it’s known. 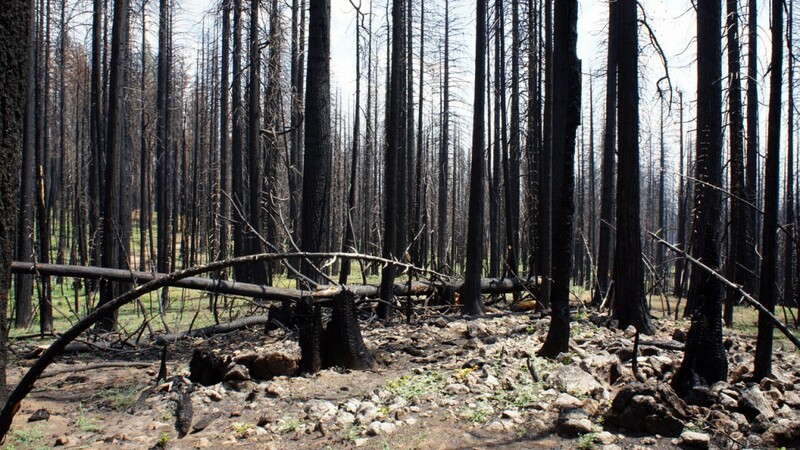 Benech is walking through part of the Stanislaus National Forest that saw some of the worst of the Rim Fire. She says most of the dead trees will only stand for a decade or so. “Picture all those logs lying on top of each other, jack-strawed with that vegetation coming back through,” she says. Once they’re on the ground, there’s a risk of making the next fire more intense, damaging the soil and slowing forest recovery. To deal with the fuel load, the Forest Service has made a preliminary proposal to open up about 44,000 acres for logging companies; that's about a third of agency’s burned land. Not all the trees will be taken. Benech points to several trees with orange paint on their bark. “Those are leave trees, so those are the trees that will stay,” she says. Some animals like dead trees. Wildlife like black-backed woodpeckers moves in to eat insects, and California spotted owls hunt in the bare forest. 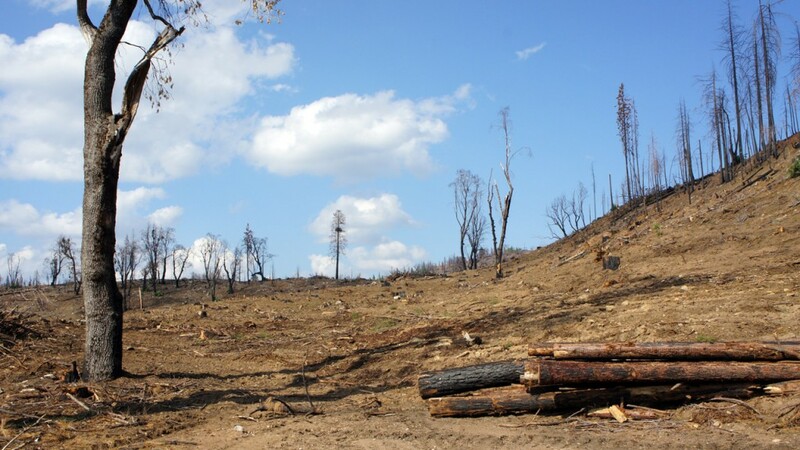 So the Forest Service is requiring that four to six dead trees be left on each acre. That number isn’t enough for some environmental groups. “Humans, when they look at a burned forest, they think it’s devastation,” says Justin Augustine, an attorney with the Center for Biological Diversity, a non-profit group. “But just the opposite happens out there in the forest.” His group doesn’t want to see the forest touched. The Forest Service says it’s trying to balance both sides. Some areas won’t be logged, but others will. Other environmental groups are aiming for some kind of middle-ground resolution. “It’s frustrating to see that the Rim Fire is the battleground between the environmentalists and those who want logging,” says John Buckley, director of the Central Sierra Environmental Resource Center. Buckley says the Rim Fire was so massive that both sides can get what they want. “You can create a mosaic of un-salvaged areas where there’s lots of dead trees and salvaged areas where most of the dead trees have been removed,” he says. It’s possible that many areas won’t be logged no matter what the Forest Service proposes. Logging companies only have about a year to do the work, because beetles are already damaging the dead trees, making them less valuable. For many scientists, the size of the Rim Fire also provides an opportunity to study the effects of salvage logging. “It’s surprising that, although salvage logging has been controversial, there’s not all that much scientific research in places where we’ve had frequent fire,” says Malcolm North, a scientist with the Forest Service. More studies on the ecological benefits of dead trees have been done in the Pacific Northwest, where fire is less frequent. Less is known about Sierra Nevada forests. North says further study could help answer questions about how many dead trees should be left on a landscape. Four to six per acre may not be enough. What scientists do know, he says, is that the area will burn again and dead trees will provide more fuel. “It may burn up all the trees that are regrowing.” Downed trees could also make it difficult for larger wildlife like deer to migrate through the area. North and other ecologists are setting up study plots in the Rim Fire burn area and are hoping learn more about wildlife responds to both logged and unlogged areas. The Forest Service will release final plans about how much logging will be opened up after the Rim Fire by the end of this week.